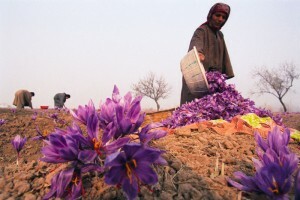 One of the most painstaking, laborious and low yielding produce in the world but used in most of the countries infamous and delectable street side tagine eateries, Moroccan saffron is internationally recognized for its specific taste and Taliouine saffron festival, a must visit on your holiday in Morocco. Moroccan saffron is produced entirely in a small region just south of the Moroccan High Atlas Mountians, along a stretch of dusty Moroccan road 50 miles from Taliouine to Tazenkht: in one of the most successful saffron growing regions in the world, making this regional trip in Morocco a well rounded, representative and very worthwhile cultural experience. Visit Morocco in October each year for the Taliouine saffron festival, between the grand Kasbahs in Ouarzazate and homely, humbling Riads in Taroudant, the land shines brightly with acres of rich purply-blue tones containing this precious spice known locally as ‘red gold’ or ‘blood of the gods’. Visitors are always welcomed to join faming familes in harvesting the spice, and sampling food and hot drinks based around the saffron. Vital to the economy and livelihoods of local families, after autumn arrives, the crocus flower must be picked very gently one by one before it closes for the day after sunrise leaving a short window to harvest each day. Approximately 150,000 croci flowers are required to obtain just 1kg of Saffron making this a highly valued commodity in the region and facilitator to a better life for its family farming communities. Development of saffron cooperatives and rural tourism in the Taliouine area is part of a nation wide initiative to encourage socio-cultural activities and allow the world to discover and share in these largely hidden Moroccan secrets. This entry was posted on Monday, June 24th, 2013 at 8:45 pm	and is filed under Beyond Marrakech and the Atlas Mountains, Marrakesh Excursions. You can follow any responses to this entry through the RSS 2.0 feed. Responses are currently closed, but you can trackback from your own site.